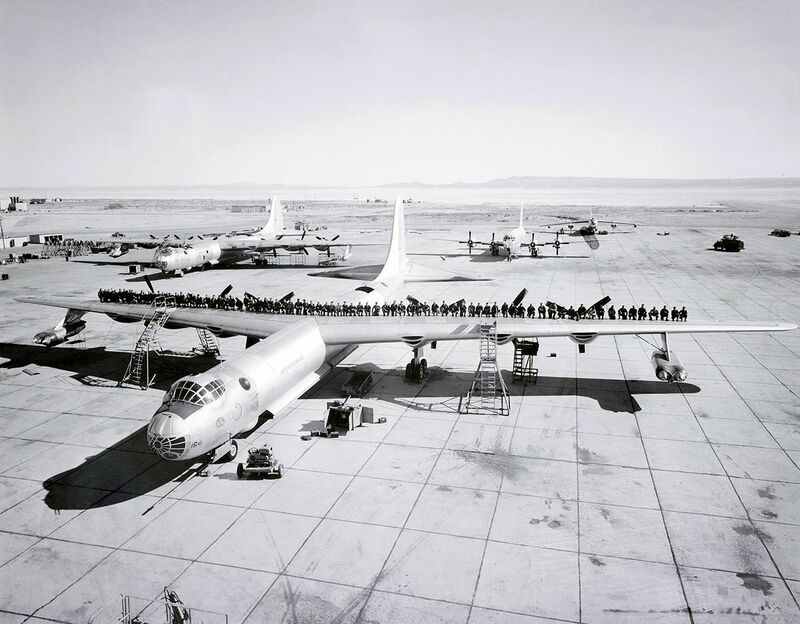 The cool undated photo in this post from the Edwards Air Force Base (AFB) flightline featuring B-36 crews standing on top of the Peacemaker wing clearly shows why this strategic bomber had been the largest mass-produced piston engine aircraft ever made. In the 1950s in fact the 163-foot-long bomber, with its 230-foot wingspan and six rear-facing compound radial engines, dwarfed every other warplane in America’s arsenal, including the B-29 Superfortress. Actually catwalks were placed inside the wings of the B-36 to give mechanics the chance to walk out and change spark plugs on the engines in flight. Furthermore most of the aluminum rivets in the wings were 3/8″ diameter. Quite impressive! However the B-36 was more than a gigantic plane, as shown by a very special mission flown by the aircraft on Dec. 7, 1948. That day in fact a Peacemaker driven by Lt. Col. John Bartlett flew from Carswell Air Force Base (AFB) in Texas to Hawaii, simulated dropping a bomb on an assigned target and flew back home. When Bartlett and his crew returned, having successfully hit his target without needing to refuel, U.S. military officials realized the B-36’s potential. If Bartlett could fly from Texas to Hawaii and return home, he could fly round trip from Maine to Leningrad, counterbalancing the threats of missile attacks from bellicose Russian generals in the East. In the B-36, the U.S. had found a powerful deterrent against Soviet aggression.